Stress-Aid formula for breeding, nesting, moulting and new environments. With plums, mealworms and ashberries. 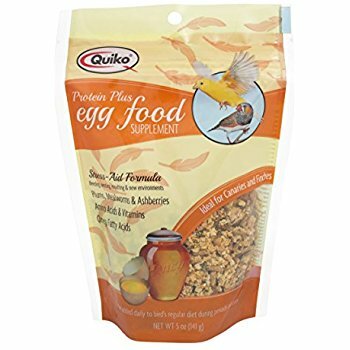 Ingredients; Dried Egg, Wheat Flour, Dehydrated Plums, Dried Meal Worms, Sugar, Honey, White Millet, Niger Seed, Dried Mountain Ash Berries, Corn Gluten Meal, Dehulled Soybean Meal, Calcium Carbonate, Monocalcium Phosphate, Dicalcium Phosphate, Salt, Potassium Chloride, Vegetable Oil, L-Lysine, Magnesium Oxide, Vitamin A Supplement, Choline Chloride, DL-Methionine, Dried Lactobacillus Acidophilus Fermentation Product, Dried Lactobacillus Casei Fermentation Product, Dried Bifidobacterium Bifidum Fermentation Product, Dried Enterococcus Faecium Fermentation Product, Yucca Schidigera Extract, Vitamin D3 Supplement, Vitamin E Supplement, Niacin Supplement, Vitamin B12 Supplement, Ascorbic Acid, Riboflavin Supplement, d-Calcium Pantothenate, Menadione Sodium Bisulfite Complex, Biotin, Folic Acid, Thiamine Mononitrate, Pyridoxine Hydrochloride, L-Ascorbyl-2-Polyphosphate, Zinc Sulfate, Ferrous Sulfate, Manganese Sulfate, Copper Sulfate, Potassium Iodide, Cobalt Sulfate, Sodium Selenite.